Google Home or Amazon Echo - Which Is Best for Audiobooks? 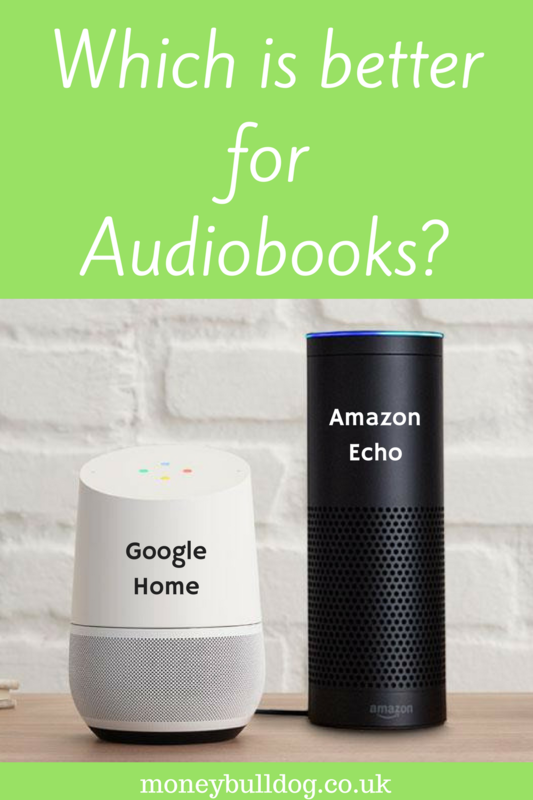 In this post we look at the pros and cons of both Google Home* and Amazon Echo* when it comes to audiobooks, to help you decide which of these devices is the right one for you. In 2008 Amazon made a huge announcement, that it was buying the audiobook company Audible for $300 million. Since then, it has been growing the business so that there are now a massive 200,000+ audiobooks available for users to buy individually or on a subscription basis from Audible* – which could save you a small fortune if you listen to lots of audiobooks! All of Audible’s audiobooks are also read by narrators or celebrities, so you don’t have to endure a monotone robot reading them to you. One of the benefits when you buy an Amazon Echo* or Echo Dot* is that you will have access to all of the Audible audiobooks in your library by simply asking Alexa to play one for you on your Echo. Not only this, but your Amazon Echo will also be able to read your standard Kindle ebooks for you at no extra cost if you’re not all that bothered about having a celebrity read them for you. As we can see then, Alexa and the Amazon Echo have a lot to offer those who want to hear their books read aloud. So, how does Google and the Google Home device* fare when it comes to audiobooks? Earlier this year (2018) Google announced that it was finally going to be selling audiobooks via its Google Play store. While I struggled to find an exact number of how many audiobooks Google currently have available to buy, I did notice that some of the books I had recently purchased for a friend via Audible weren’t yet available on Google Play. While Google are adding new titles at a fast pace, this could be frustrating to some if you like a certain author and the titles just aren’t there for purchase. Google also don’t yet offer a subscription service and although this might not mean a lot at present – as Google are currently offering some decent discounts on individual audiobooks to kick-start their sales – it could mean that Google becomes the more expensive option in future for regular audiobook listeners, if and when these discounts are rolled back. It’s also worth noting that a Google Home device can’t read standard ebooks either and it also can’t access any books you might have already bought from Audible, which could sway regular readers over to Amazon’s Echo if they want to start listening to regular books or audiobooks they’ve already bought. So, what have we learned from the above? Put simply, I feel that the Amazon Echo* – at least for now – is a much better option for those who regularly listen to audiobooks and who also want the option to be able to listen to their current kindle library out loud. While Google might catch up in the not so distant future, it’s the very fact that they are even playing catch up right now that would sway me over to Amazon if I were buying one of these devices with purely audiobooks in mind.